Kastar ATV Axle End Thread Restorer 7 Piece Kit contains 7 different dies to restore threads on axle ends of ATVs such as Honda, Kawasaki, Suzuki, Yamaha and more. Die sizes included: M14-1.50, M16-1.50, M18-1.50, M20-1.50, M24-1.50, 3/4''-16, and 7/8''-14. Kastar Valve stem fishing tool. Used to pull valve stems and inner tube assemblies through the valve stem hole on vehicle rims. Three functions: valve stem remover, valve core removal, tire deflator. Kastar Shock Absorber fork Oil Replenishment Kit. Used on Big Twin® engines to set up crankshaft bearing endplay. Allows inner bearing races to be installed and removed without pressing them on or off. Kastar Crankshaft Bearing End Play Setup Tool. Clear plastic tube and special fitting allows replacement of the oil in the fork through the drain plug. No need to disassemble the fork and front end. Kastar Cylinder Sleeve Hold Downs. Specialty nuts used to hold down cylinder sleeves during service procedures. Applications: Harley-Davidson® Big Twin®, Twin Cam®, Sportster® and models with 3/8'' studs. Kastar Rear Isolator Replacement Tool. Offset ratcheting wrench with extended handle. Applications include: S1 Lightning®, S1 Cyclone®, S2 Thunderbolt®, S2T Thunderbolt®, and S3T Thunderbolt®. Kastar Springer fork Bearing Adjusting Tool. Adjust the steering stern adjuster nut to allow for proper neck bearing endplay. Used on Harley-Davidson® motorcycle Springer® forks. 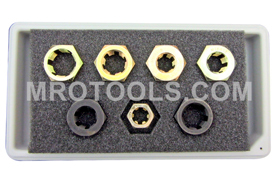 Kastar Neckbearing Adjustment Tools for Harley-Davidson® Motorcycles. Tapered end allows easy access to the neck bearing adjusting star on Harley-Davidson® front ends. Kastar Wheel Bearing Plugs. Used to plug the wheel bearing seals on Harley-Davidson® motorcycles to prevent moisture from entering the bearings while the rim is being cleaned. Kastar Lock Ring Tool. Allows access to the fuel filter and pump as the lock ring is connected to the pump. Kastar Rocker Box Cover Wrench Replacement Bits. Three 3/16'' Allen bits packaged in a polybag. Kastar ATV Axle End Thread Restorer 7 Piece Kit. Contains 7 different dies to restore threads on axle ends of ATVs such as Honda, Kawasaki, Suzuki, Yamaha and more. Kastar Low Pressure Tire Gauge. Reads 1 - 20 PSI, 1/2 lb. increments. for ATVs, lawn tractors and motorcycles. Kastar Intake Manifold Wrench. Reversible ratcheting box wrench used on BigTwin® engines to install/ remove intake manifold socket head cap screws. 1/4'' ball-end Allen bit. Kastar Rocker Box Cover Ratcheting Bolt Wrench. Reversible ratcheting box wrench used on all Harley-Davidson® Evolution® motor rocker box covers. Low profile allows clearance between the frame and engine. Kastar 14-Blade Valve Lash Gauge Set. 14-pc. set of 4'' x 1/4'' feeler gauge blades, thickness .002'' through .015''. Kastar Exhaust Bracket Wrench. Reversible ratcheting wrench used to remove/install the front exhaust bracket on Harley-Davidson® Dyna® model Twin Cams® from 1999 to present. Kastar Lower Rocker Box 7/16'' Wrench for Evolution®. Reversible ratcheting box wrench used to install/remove the lower rocker box on Harley- Davidson® motorcycles with Evolution® engines (19941999). Kastar Lower Rocker Box 7/16'' Wrench for Twin Cam®. Reversible ratcheting box wrench used to install/remove the lower rocker box on Harley- Davidson® motorcycles with Twin Cam® engines (19992006). Kastar Rear Fender Bolt Wrench. Rocker box wrench used to remove/replace the bolt that holds the rear fender to the frame on Harley-Davidson® Touring® models, 1988 to present. Kastar Magnetic Speedometer Sending Unit Wrench. Wrench used to remove/install magnetic speedometer sending units for Harley-Davidson® Sportster® motorcycles and other magnetic speedometer sending units. Kastar 17mm X 19mm Front Axle Wrench. Wrench used to remove/install the front axle shaft on motorcycles with a female six-point socket. Used on late models of Honda, Kawasaki, Suzuki and Yamaha. Kastar 22mm X 24mm Front Axle Wrench. Wrench used to remove/install the front axle shaft on motorcycles with a female six-point socket in the end of the axle. Used on late models of Honda, Kawasaki, Suzuki and Yamaha. Kastar 6-Tooth Crankshaft Wrench. Reversible ratcheting wrench used for rotation of the crankshaft on all 6-spline engines (2007 Harley-Davidson ® Sportsters® and 2008 Buell®). Kastar 17mm Engine Oil Drain Plug Wrench. Used to remove/install the engine oil drain plug on Metric V-Twin® motorcycles: Honda Shadows®, Yamaha V-Stars®, Kawasaki® Vulcan® and other metric motorcycles. Kastar 24-Tooth Crankshaft Wrench. Used for rotation of the crankshaft on all 24-spline engines (2006 Harley- Davidson® Dyna®), and to check engine timing and parts clearance. Fits perfectly on Dyna® model. Kastar Rear Axle 36mm Nut Ratchet Wrench. for use on FL Touring® models with 36mm axle nuts. Kastar Oil Pressure Indicator Lamp Sending Unit Wrench. Reversible ratcheting wrenches used to remove/install the oil pressure indicator lamp sending unit on Harley- Davidson® FL Touring® motorcycles (1999 and up). Kastar Oil Pressure Indicator Gauge Sending Unit Wrench. Special low profile Wrench used to remove/install the oil pressure indicator gauge sending unit on Harley-Davidson® FL Touring® motorcycles (1999 and up). Kastar Transmission Neutral Light Wrench. Wrench with special extended 7/8'' low profile head used to remove/install the transmission neutral light switch on Harley-Davidson® TwinCam® motorcycles. Kastar Ten Spline Ratcheting Output Wrench. Used for rotation of the crankshaft/check engine timing and parts clearance on Sportster® motorcycles. The 801 Kastar ATV Axle End Thread Restorer 7 Piece Kit is one of thousands of quality tooling products available from MRO Tools. Please browse Kastar Motorcycle Specialty Tools for tools similar to the 801 Kastar ATV Axle End Thread Restorer 7 Piece Kit. 801 Kastar ATV Axle End Thread Restorer 7 Piece Kit description summary: Kastar ATV Axle End Thread Restorer 7 Piece Kit. Contains 7 different dies to restore threads on axle ends of ATVs such as Honda, Kawasaki, Suzuki, Yamaha and more. 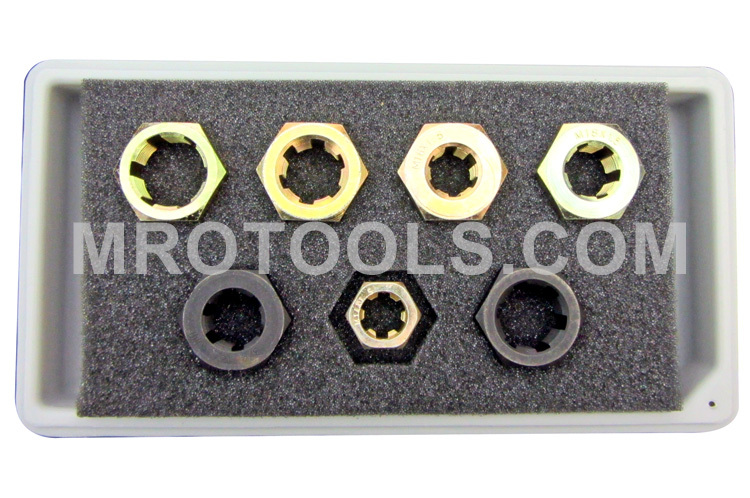 Quantity discounts may be available for the 801 Kastar ATV Axle End Thread Restorer 7 Piece Kit. Please contact MRO Tools for details.